This muffin recipe is so easy to make and only requires 1 bowl! 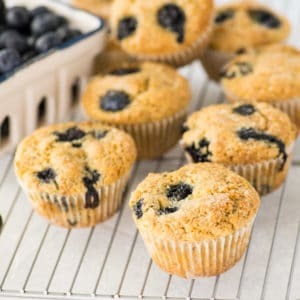 Fluffy muffins adorned with juicy blueberries with a crunchy bakery-style topping. These healthy muffins are the BEST! Preheat oven to 425 degrees Fahrenheit. Adjust rack to the center in the oven. Grease muffin pan or line with liners. Make flax "egg": In a small bowl, mix ground flaxseed with water. Let sit 5-10 minutes until it becomes gelatinous. Make vegan "buttermilk": Mix almond milk with apple cider vinegar. Let sit 5-10 minutes until curdles. In a large mixing bowl, whisk together flour, sugar, baking soda, baking powder, and salt. Make a small well in the center of the dry ingredients. Add oil, vanilla, flax egg, and buttermilk. Gently fold with rubber spatula until just corporated. Add blueberries and fold until just combined. The batter will be thick. Using a greased 1/4 measuring cup, "plop" batter into prepared pan. If you run out of batter, fill any empty cups halfway with water. Add blueberries to the top (optional) and sprinkle with cane sugar (also optional). Place baking pan into the oven and reduce oven temperature to 375 degrees Fahrenheit. Bake for 30 minutes. Check if done by inserting a toothpick and ensuring it comes out clean. Remove from oven and let cool for 5 minutes. Transfer to cooling rack and let cool for another 10 minutes. Leftovers can be stored on the counter (about 3 days), the fridge (about a week), or the freezer (about 3 months).